Cleanliness was non exsistant and food well below average. Entertainment was good but staff rude for the most part and we would certainly never go again. After waiting for 3hours we were allocated our room, which was diabolical and nothing like the pictures advertised in their brochure or on their web site. The floor was dirty, used tissues were by the bed, damp on the walls in both the bedroom and bathroom, which had been painted over and the paint was blistered and coming off the walls and mildew on the window frames and in the shower area & no light in the shower. We were eventually offered a different room with a bath instead of a shower, only for this room to have a severe damp problem, as well as a broken picture which hung directly above the bed with shards of glass exposed. Also the accommodation was very difficult to locate and quite some distance from the main area. We paid extra to stay in a Silver Bungalow for 7 nights. This was our 3rd visit to Butlins in 3 years and is going to be our last. The allocated accomodation was shabby and dreary looking and was in need of a complete refurbishment. We asked to be moved but were told the resort was full no other apartments were available. On return to the bungalow one afternoon, the place was crawling with ants and flying insects which had got through a hole in the wall behind the sofa. An employee came and sprayed the affected area and left a few ant traps/repellents which seemed to work. We booked a caravan at Butlins Minehead. I didn't even realise they had caravans there until I typed Butlins Minehead in Google. We had a bargain the caravan was half the Butlins price for a week in August. The caravan itself was lovely,peaceful and with a picnic area and patio table.It was spotless inside we just had to take our own bedding. I cannot recommend the caravan over a chalet high enough. We decided to stay in the silver bungalows plus, wide screen TV, DVD player, microwave and other things you want in a home from home. The chalet was cleaned to a high standard even if you seen a cleaner go past ya chalet if you asked them if you could use their hover to clean sum things up they would offer to do it for you. Fabulous. The location is great. We were supposed to stay for a week but because of the lovely weather we booked for another week, plus a tip. If you extend your holiday when you are on resort you get at least 50 percent off brochure price. The beach is safe and clean, the shops bars and restaurants in Minehead are great especially the three dogs I think. The best thing for us about butlins is the entertainment. It caters for young and old alike. My kids are 3 4 n 16 but all of them have a great time. The youngsters love the first part of the night with Billy Bear then after that its adult show time. I must say that the shows the reps put on are amazing, its just like being in London's west end, the reds are talented and hardworking and always have time for you. The staff over all are friendly, however a lot are foreigners who's English is very poo but with some simple hand gestures and a lot of pointing you get your point across. 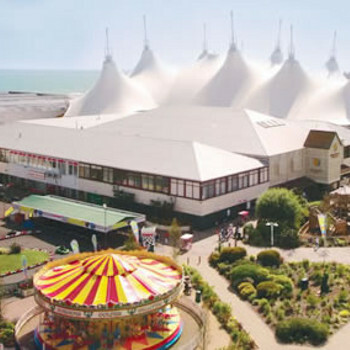 Butlins is a great traditional British family holiday and we go about 3 times a yr. It is constantly improving, and upgrading. You are sure to have as good as a time as me and my family did. Happy holidays!!!!! I stayed here half board last June. The chalets are filthy, the interconnecting doors are paper thin so you can hear everything going on next door. Unfortunate, if like me you were put next to drug taking , highly sexed teenagers. The food was awful,cheap, full of cholesterol, and likely to give you serious health problems.However most people who go here are complete chavs so would be quite at home, a bit like a council estate really, including teenagers and kids completely out of control, with no consideration for anyone else. Staff are rude and so used to complaints they very rarely take you seriously.A word about the cleaning,there isn't any. I had a brown stain on my duvet, together with someone elses body odour. Avoid this place at all costs, and go up market. Went self catering to silver plus accommodation. The chalet had microwave, cooker, fridge etc as well as widescreen t.v. It was roomy but a bit out of date. The staff were so friendly, everytime we bought a drink in the bar, or newspaper at the shop the staff asked if we were enjoying our holiday. The shows were very good. as we went just before christmas we had panto shows and xmas themed shows. Exceleent!! The only negative is the fact that the place looks a bit shabby and in need of a lick of paint. We went for 3 days which is just enough. any more and you may be bored. It took quite a while to be shown to our accommodation on arrival, but I was pleasantly surprised by the size of the room. My friend and I had booked a twin room in standard Silver accommodation, however we were given an adjoining double room and twin room meaning we had 2 TV's and 2 bathrooms, 2 bedrooms between us. Presumably because the resort wasn't full. It wasn't cleaned well though, and the towels were not changed once and the shower room was a hazard waiting to happen. The food was utterly revolting. I'm a vegetarian and the food options were slim. My meat eating friend fared no better. I wish I'd gone self catering really. I ended up eating chips and salad, though even their chips tasted odd! And the food and drinks were fairly pricey elsewhere. Staff looked really quite unhappy, I felt sorry for them. It was a bit boring really and not much to do. It was not quite what the brochure made out, and I would see no reason to return. We stayed in Deluxe Half Board accommodation the apartment was of a high standard comprising of: - Lounge with 2 sofas 28" TV DVD & video also had 2 cabinets hiding fridge and ironing board/iron. One double bedroom - bed had canopy over very nice also second TV, and safe in wardrobe. Two twinned rooms all three bedrooms very comfy and well decorated. Nice bathroom with shower/bath. As it was a deluxe room there was also a bottle of wine /box of chocolates waiting in the lounge for us, along with a personal parking space outside the room. Patio doors lead from the lounge into a small enclosed patio - will be good in summer. The food was good also.